VROOOOMMMM!!! What the…… I must have fallen asleep on the flight deck. Roll-Roll-Roll….. I have to get off this deck. I hope the safety net catches me. Yes!! I have fallen into it…… VROOOOMMMM!!! Who ordered these launches and how did I miss it and fall asleep on the flight deck? Weird how our mind works when we are awakened suddenly. Our senses are wide awake sending signals to our brain, but our brain is not fully awake for processing the incoming information. As the rest of my brain finally woke up and got engaged I could realize that I wasn’t on the flight deck of a carrier. I was in a tent off of a road in Georgia. I hadn’t rolled off the flight deck into the safety net. I had rolled into the side of my tent and almost rolled the tent in the process. 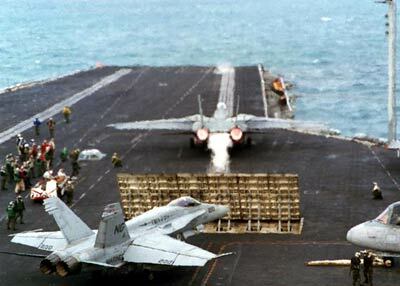 Oh, and those F-14 Tomcats being launched? That was actually the logging trucks that started back running and were going full blast. What seemed like a safe distance from the road last night now seemed way to close to the side of the road. It was still dark and earlier than our planned wakeup time but getting to sleep with these trucks blasting by just wasn’t going to happen. Time to get up and see how Rod was doing. The trucks had woke him up too and when I called his name out I got the normal Rod response, “Yep, I am up.” That’s a good sign. Then it was time to get out of the tent. Yesterday was a true test and measure of just how high Rod’s pain tolerance was. This morning was a renewal of that test in a big way. Even with the pain, he wasn’t going to stop. I truly believe he would have crawed into Fargo if he couldn’t walk. So the first action item for the morning was to doctoring Rod’s feet. Cleaning wounds, draining blisters, applying antiseptics, and putting special pads on his feet. My oldest daughter is a certified athletic trainer who has worked with various college sports teams and is presently working on her PhD at the University of Kentucky. Prior to the UFC she had given me some tips on dealing with blisters and had given me some special pads that are similar to mole skin but much better. I had never seen them but if she said they were good I was going to take them. All through this, Rod was a trooper and just sucked it up and got through the pain. Luckily his feet had not swelled up that much during the night and we were able to get his shoes on. Next, get the boats packed, balanced, tied together and then back on the road. Rod was actually walking pretty good. Either the pads were working or he now had the energy to just mentally block the pain out. As I looked up the road, I saw a familiar van coming. It was Chief. He had been tracking us on our SPOTS and was coming to welcome us to Fargo. This is the video he took of our portage. Oh, and he had some cold Cokes. Ohhhh soooo good. As you can tell from the video we made it into Fargo. Guess what’s there? A restaurant and it was breakfast time. Let’s go eat!!! Now, Chief is a pretty tough guy in his own right. The creator of the WaterTribe, designer of the Evergaldes Challenge, and the UFC. He is a veteran of the Vietnam War, US. Marine Corp, and he sleeps in a van when he is managing the race. So not a guy who expects the Hilton. I share that with you to get a measure of just how bad Rod and I must have been for him to say what he said. When we got into his van to go to the restaurant, his first comment was “Gee, you guys really stink! Man I hope I can get this stink out of my van after you guys leave.” I looked at Rod and I am thinking, I don’t smell anything. I know we must have smelled but you would not have known it at the restaurant. 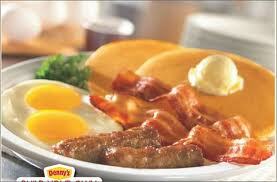 They served us a wonderful breakfast and our bodies needed it after what we had put them through on the portage. 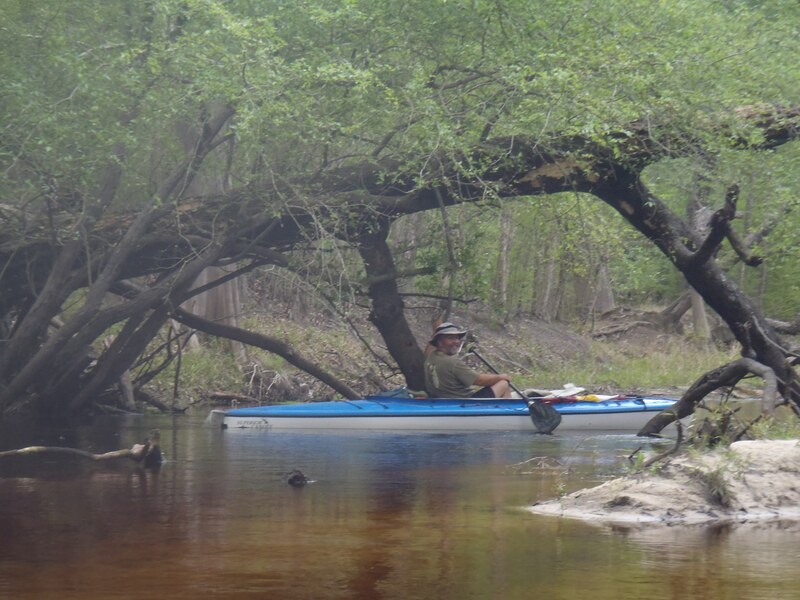 enjoying our paddle down the Suwannee River. At each bend there were these beautiful sand banks that were perfect camp sites. There was no problem finding a nice camp site and it was quiet. That night as I sat in my tent I couldn’t help but think about the fact that we now only had two real stressful situations in front of us. 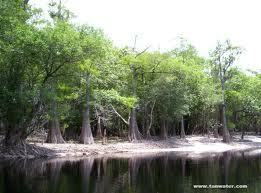 The first would be the rapids at Big Shoals and the next would be the big open water crossing after Cedar Key. Just hope Rod’s feet don’t pick up an infection. Oh No!!!!! I Forgot to Pack My Running Shoes, Will My Merrill Amphibians Work ????? Most of the gear that I used during the UFC I was very happy with and would use the same gear if I was doing the event again. My portage cart, however, is one piece of gear that I would not use again. Not that it isn’t a great cart. It is very well constructed and can carry a heavy load. It just requires a lot of assembly and that introduces a risk due to the potential of losing a nut or bolt and it requires a lot of time that I could have used sleeping. Knowing this, I decided to assemble my cart before I went to bed. The other pain with this cart is the wheels. They are bigger in diameter than most which is good, but the tube that the supplier used inside of the wheel severely limits what you can use to inflate the tube. I was thankful that I tested what was the best way to inflate these tubes. A bicycle pump wouldn’t work, a mountain bike tube pump wouldn’t work and an air compressor wouldn’t work. It was the restricted space between the tube inflation connection and the wheel spokes. The only thing that would work was a CO2 inflation device. Before I left on the UFC I had tried to get a different tube with a longer and angled inflation connection but the bike shop didn’t come through for me on this. Lesson learned? Don’t rely on one shop to get you what you need and allow their problems of getting products to become your problem. They swore up and down they would have the tube in plenty of time and I trusted that they would. Well they didn’t and their response was, “Sorry.” Sorry?!?!?! Well sorry will not inflate my tube if I have a flat during the 40 mile portage. So I ended up carrying three spare CO2 cartridges. One to inflate my tires and two for spares in case of a flat. So with my portage cart assembled and my special, top-secret hauling poles installed, I started to get my portage gear sorted out. Light-weight, long sleeve shirt – check. Light-weight hat – check. Light-weight boardshorts – check. Safety vest – check. Two pairs of heavy-duty socks – check. Powder for the feet – check. Gorilla Tape for hot spots – check. Body Glide to prevent rub spots – check. Light-weight gloves – check. Running shoes – ………………….. NO WAY!!!!! I had packed my second set of Merrill Amphibian Water shoes instead of my running shoes. I could not believe it. Confirmation that my packing strategy for the checkpoints was flawed – CHECK!! Oh, and these shoes were brand new. Great, I am getting ready for a 40 mile portage in a pair of shoes that are built for being in the water, have hard bottom soles, very little cushion, lots of mesh for draining water and not broken in at all. I couldn’t believe it but there was nothing I could do about it so I just sorted the rest of my stuff out and went to sleep. Gee, what a major mistake! What a treat it was to be able to get up in the morning and not have to get into wet paddle clothes. It was a nice change of pace and packing was so much easier on land. Both of us were pretty careful to pack our boats where they would be balanced on the portage carts. With everything secured and packed up we started the portage to meet Chief at a restaurant in St. George called the K&C Oak Tree Cafe. I was so looking forward to some fresh eggs, bacon and pancakes. It was only a couple of miles to the cafe and it gave us a chance to see how our portage rigs were doing. Since it was so early in the morning there was very little traffic so we kind of had the whole road to ourselves which was nice. I was pretty pleased with my setup but I was also stressing over my shoes. I just knew that I was going to have some serious problems with blisters. Chief was there right on time and no one was in the cafe. Well the K&C Cafe didn’t disappoint us. The food was great, the servings were large and boy did I eat. I didn’t care if I was going to feel stuffed. I wasn’t running the portage. I was going to be walking it and that was going to take a lot of energy, and it was supposed to be fairly hot today. The folks at the cafe were great. The owner of the cafe had really gotten into the race and was doing everything he could to help out the contestants. To our surprise, as we were leaving, he came out with two care packages for us for our lunch. A care package of barbeque ribs, bake beans, potatoes and bread. Oh we will be eating good today! The road that we were taking to Fargo is Georgia State Road 94 which turns into Florida State Road 2. If you look on a map you will see that this road is a straight two lane road out in the middle of no where. The main traffic on this road is big trucks hauling logs and I have a pretty good idea they get paid by the load because they move pretty fast. Getting hit by one of these bad boys could really ruin your day. What made it even more interesting was that there is not a big shoulder on this road. So here are two crazy guys with canoes, walking on a road that is the main road for logging trucks, through a very unpopulated part of Georgia. What Rod and I experienced while on this road was nothing but good ol’ country friendliness. 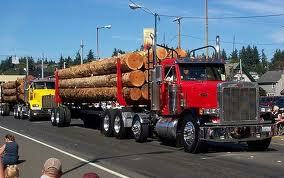 The logging trucks would talk to each other by CB letting the other truckers on the road know where we were. Then they would get over long before getting to us and then blow their horns and wave. In fact, one actually stopped and asked what were doing. Instead of being mad we were on the road they were encouraging us. Folks driving by would also slow down and wanted to know what we were doing. Then the owner of the K&C Oak Tree Cafe pulled up when we were about 20 miles out of St. George and gave us a couple of cold water bottles. The folks in this area were great! The day turned out to be a hot one which made the road hot. Rod and I had a strategy of stopping every hour to inspect our feet and to proactively put tape on if we were starting to experience any hot spots. In addition to the tape, I was also using lots of foot powder and rotating my pair of socks to keep them dry. Each time I took my socks off I was expecting to see some blisters but each time I didn’t find any. I was shocked and figured God was looking out for me. Rod, on the other hand, was starting to have some problems with blisters forming. He was taping the hot spots but for some reason the blisters kept forming. When we stopped for lunch (which was those awesome K&C Oak Tree Cafe care packages) Rod really worked on his feet. Each hour that passed, things got worse and worse for Rod. We had a long way to go and the rate the blisters were forming was problematic. Now Rod is an extremely tough guy, and I will not go into graphic details of his feet, but I will say that there are only so many layers of skin on your feet before you start getting into nerves and blood vessels. Our goal was to get the portage done in one day but that goal was in jeopardy. As I watched Rod walk, I started to think about what could we do differently. We could stop and get Rod off his feet, get a good night’s sleep and hope for the best tomorrow. My concern with doing this was that his feet would swell, be more painful tomorrow and he would not be able to get on them. I could continue on and this would be the end of our partnership on the UFC. Yes, that was an option, but it wasn’t an option in my mind. Rod had helped me and now was the time for me to help him. That is what team work is all about. The other option was maybe I could pull both boats and then the pressure on his feet would be less. Could I pull both boats? That would be about 300lbs on wheels and a length of 35 feet. We had another 11 miles to get to Fargo. Rod couldn’t take it any more and quite frankly, I couldn’t take seeing him suffering with each step. He was in some terrible pain and for him to allow me to try and pull both boats was an indication of the the level of pain he was in. So we tied the two boats together, did some readjusting of the loads on the boats to balance it out, and I started the pull. I was surprised that it wasn’t that bad once I got the boats rolling. Hey, we just might make it! 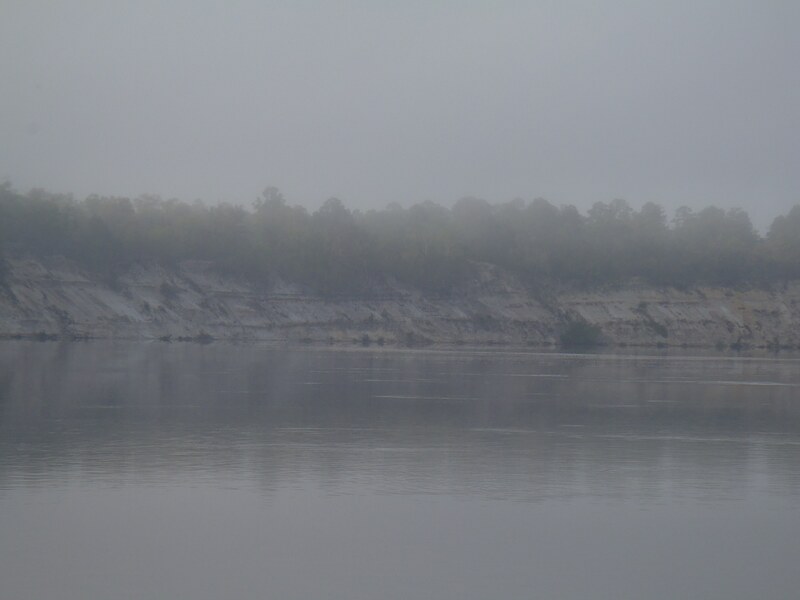 We had been on the portage all day and we were starting to lose daylight. I have always liked to operate at night and the night was a welcomed change. The temperatures were cooler, the logging trucks had shut down and the visual of looking at this road that seemed to go forever wasn’t there. 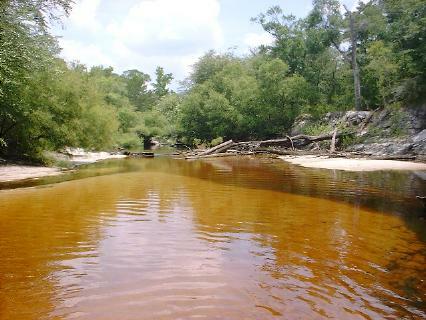 So it was just Rod and myself walking on this road going through the Okefenokee Swamp. For me, when I am doing something like this, I mentally compartmentalize things such as any pain or uncomfortableness I am experiencing and try to focus all my mental energy into one thing. That one thing was moving these boats forward one step at a time. Our speed had dropped considerably but the first 4 miles seemed to go by pretty well. Then it changed. Fargo is higher than the section of road we were on going through the swamp. It is also a long, slow rise in elevation and that increased the level of difficulty of pulling the boats. I was getting very tired but at the same time I was determined to get to Fargo tonight. If we could do that, then we would be back in the canoes going down the Suwannee River. Rod would be able to get off his feet thus giving them a chance to heal and we would be making some easy miles since we would be going down river. The other thing that was of concern is that it started to rain so now my feet are wet and having my feet develop blisters now would be a death nail to our attempt. Talk about a bummer to get this far in the UFC and then have to pull out because of some blistered feet. Then through the black night my head lamp caught the flash of a road sign. It was a sign saying how far it was to Fargo. Yeah! When you start seeing street signs with your destination, that is a sign you are getting close. For me that was mentally uplifting. Unfortunately for Rod, it was a sign of just how much farther he was going to have to suffer. I knew we were in trouble when he started to get a head of me and his head lamp was scanning both sides of the road. He couldn’t take it any more and quite frankly our speed was now down to a crawl. We were only a couple of miles out of Fargo but it was also the first time I had seen Rod beat. He couldn’t go on any more, his feet were a mess and the pain was just too much. I do think I could have made it to Fargo, but at the same time I was also very beat, sore and tired so I agreed. I still had the fear that Rod would not be able to get on his feet in the morning but I also knew he couldn’t go any more. So we pitched our tents on this small drive way that was pretty close to the road. There was no traffic on the road and we would be getting up early so it seemed ok. In looking at my feet that night I still couldn’t believe it. Not a single blister and just some minor hot spots that the guerrilla tape was addressing. The only thing I could figure is that the hard soles of the Merrill shoes kept the heat from getting to my feet and the mesh design helped keep my feet dry. I do think there was also some divine intervention going on. Even though Rod was off his feet and asleep, he still moaned through the night. I don’t know how he was able to sleep but I guess it just proves the point that if you are really tired you can sleep through just about anything. Well, tomorrow is another day. Check Point 3! Oh Man…… Food, Food, Food!! When the alarm went off there wasn’t any problem getting up because I knew if we paddled well today we would be at Fort Clinch, checkpoint 3, by late afternoon. I got right into my routine eating, doctoring my body, and packing my sleeping gear. Packing camping gear can be ok or it can be something of a bummer. Like when the gear that was exposed to the outside is dripping wet from the dew and sand collects on everything. I carry a little brush to brush the sand off but the wetness is what it is. So you end up stuffing all this wet gear into a compartment that is going to be sealed so it sure isn’t going to dry. Well that is what was waiting for Rod and I when we got outside of our tents. I am just thankful that I had bought a high quality tent that was both breathable and very waterproof. Otherwise, the night would have been like sleeping in a light rain shower from the dew seeping through the rain fly. Getting all my gear cleaned up was one more thing to add to the list of why it will be so great to get to the checkpoint. We had two big crossings in front of us, the St John’s River and Nassau Sound. The crossing of the St. John’s River was pretty non-eventful and was really kind of neat in that we paddled in front of a shipyard that had several large US Navy vessels in dry dock. I was kind of surprised that we were able to get as close to them as we did. I was fully expecting a security boat to be coming out of nowhere but it never happened. After the crossing we entered a waterway called “Sisters Cr.” I assumed that the Cr stands for creek but it is not what I would call a creek. It is a river and the current was flowing against us in a big way. We had been so lucky hitting the tides and current but today was not starting out that way. It was going to be one of those put your head down and just paddle hard. Hey, at least the wind wasn’t in our face. As I have stated in previous posts, most of my experience had been in open water and Rod’s experience has been in rivers. Since most of the water we had been paddling in was open I had taken the lead in navigation. No problem. 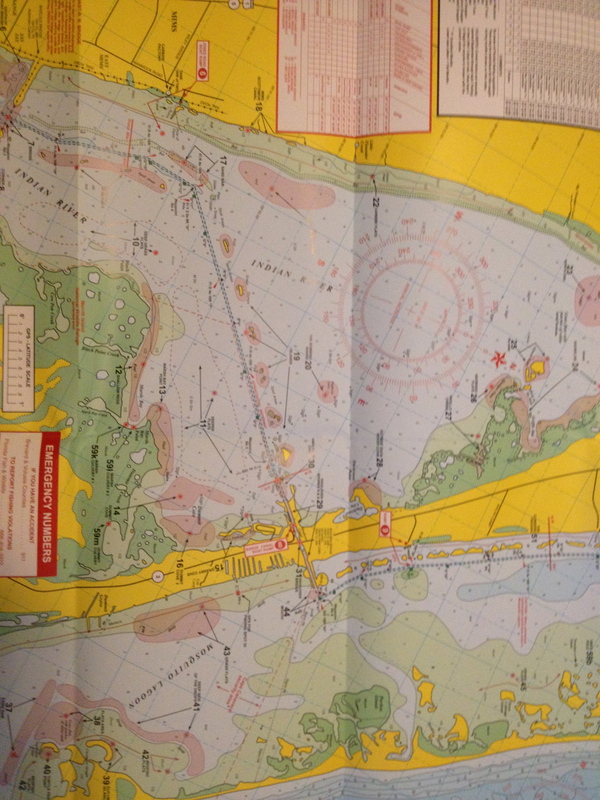 I had my GPS, my routes and my charts. I also shared in my previous posts that the manner in which I had organized my resupply bins didn’t help and, in fact, created some chaos. Well, no different on my charts. I had all the charts marked with each stage that they would be needed and had carefully put them in each stage resupply bin. I had just failed to put the chart that was the end of one stage and the beginning of the next stage in the proper bin. So as we paddled through Sister Cr and off the chart for that section I didn’t have the chart to get us from Sister Cr to Fort Clinch. 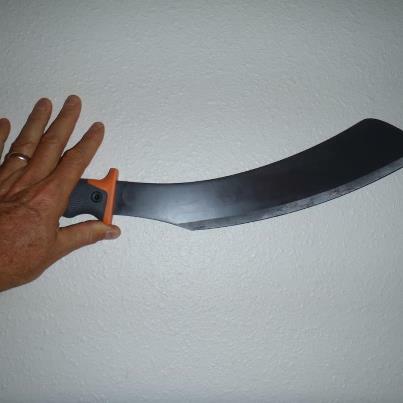 That was sitting safely in my resupply bin at Fort Clinch. Great. Now up to this point in our journey I had not seen Rod pull a single chart out, change charts at the checkpoints, or even fire up his GPS. I mean, why do that? By keeping his safe and dry we had a spare GPS. 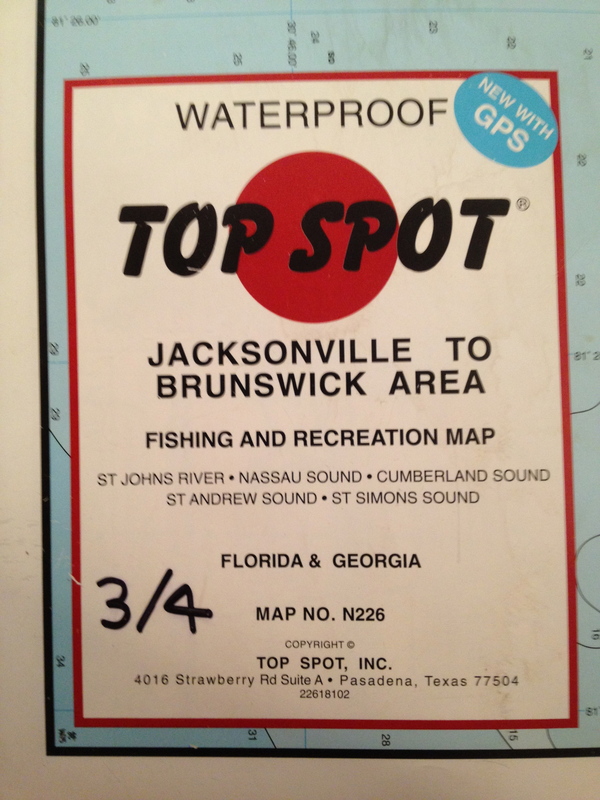 “Hey Rod, do you happen to have a Jacksonville to Brunswick Area chart?” You know, because the guy with all the open water experience here doesn’t! Rod looks at me and I could tell by the look on this face he was thinking, “What? ?” Well Rod started digging through is stuff. Some time passes and Rod is still digging through his stuff and then, “Hey! Yeah I got it!” Oh what a relief. After getting my charts organized, the paddle up to Fort Clinch was a pretty one. Passing through marshes, sea grass, Amelia City, and Fernandina Beach. 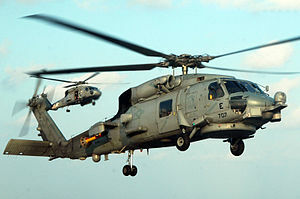 We even got a low-level fly over from a US Navy Blackhawk chopper. I guess the pilot was bored, or as Rod and I decided, it was our welcoming committee. 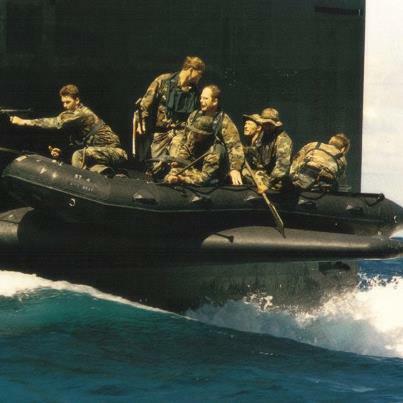 Nice of the US Navy to do that for us. The checkpoint at Fort Clinch was a large boat ramp just south of the park. It is real easy to lose your space awareness when you are looking at a chart and then trying to compare the landscape that you are seeing to the chart. That is why tacking a couple of fixes is so crucial to getting your bearings. When you are excited about the destination, you are very susceptible to getting your bearings messed up. Well that was happening to me as we approached the checkpoint. I had to keep telling myself to trust the GPS and ignore the thoughts of, “Hey, the structure over there is it, no no no… not that structure, that structure there. Hey, wait a minute, no that is not it, it is that structure over there.” None of those structures that we were looking at were the boat ramp. 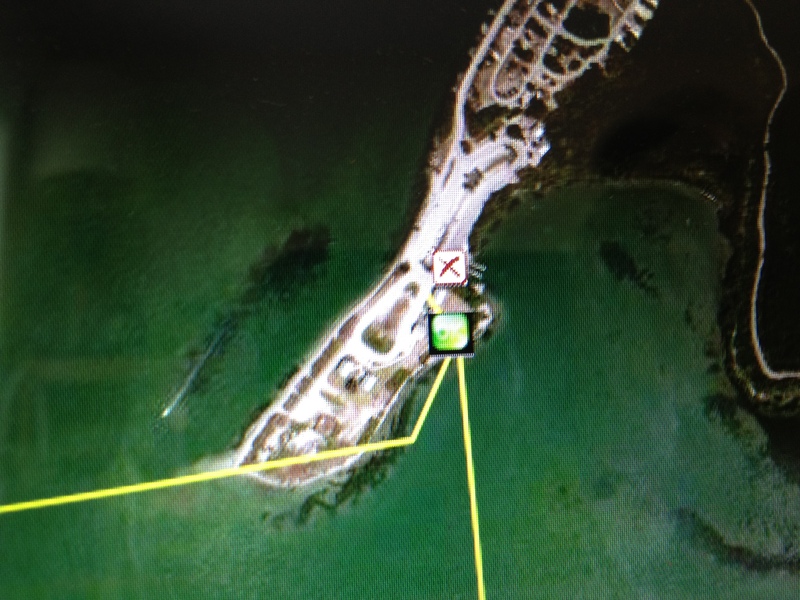 As we got closer and trusted the GPS the boat ramp came in to view and not only did the correct beach area come in to view, but there were people on the ramps structure waving and hollering at us. Man it was a great feeling and the best part was Lisa was there. This is a picture of us right after we had landed. There is a reason why my hands are on my waist. I am trying to keep my pants from falling off. I had lost so much weight my pants would fall right off me when I stood up. Lucky for me, or should I say lucky for the rest of the world, most of the time I was sitting. As with the other checkpoints, Lisa had some great fresh food for us. I know my body needed protein but fresh fruit (watermelon, grapes, apples, and oranges ) was what I couldn’t get enough of. Oh and the cold cokes were wonderful. Funny, at home I am not a big coke drinker, but on the UFC, a coke was my go-go juice. Just as we were finishing up Salty Frog, who had come to greet us, started hollering about our boats. Our boats were pulled up on the beach and were on the other side of the boat ramp so we really couldn’t see them. Now in this part of the state, the tides are very strong and large so we had pulled our boats up a far way on to the beach. As we went running down to the boats it became clear we had a problem. My boat was still on the beach but Rod’s boat was floating away. The tide had come in and floated it in just a few hours. Thankfully Salty Frog had walked over to check on them because Rod’s boat wasn’t that far away. So off I went paddling like a mad man to catch his boat. After this incident our boats were not only pulled up a far distance, but they were tied to an anchor. With all the excitement over, it was time to get to cleaning gear, repacking, and get some rest. I hoped the rest of the evening would be non-eventful. This is a video that Salty Frog made of Mosquito Magnet another UFC contestant ,Rod and myself at Ft Clinch. Thanks again Salty Frog for documenting this for us. You Want To Sleep Here ??????? The campsite we were at was one of my top five most favorite of the UFC. It was quiet, I slept great, the boats were easy to unpack and pack, and no bugs. Hey we were living the good life. I really didn’t want to leave but I also knew that if we put in a long day today and covered our planned miles we would be able to make our next check point, Fort Clinch, the following day. That would mean fresh food, a shower, and maybe a night in a hotel. 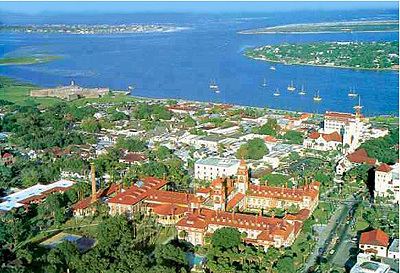 St. Augustine was the next big city that we would be coming up to. My primary concern was that we would hit the tides right. St. Augustine’s inlet is a large one which means the tides can be pretty strong which could make for a very long day if we had an incoming tide. As I had mentioned in my earlier post, Rod and I didn’t spend too much time trying to figure out departures times relative to tide shifts. We just stuck to a normal schedule and hoped for the best when it came to the tides. There is also a school of thought that says you are going to fight the tide no matter what you do. You either fight it approaching the inlet, and then run with it once you have passed, or you run with the tide to the inlet, and then fight it once you have passed the inlet. As we started the morning out I noticed we had the tide with us. Sweet! We were going to have the tide with us to St. Augustine. As we approached the city of St. Augustine, I notice a boat with a young family in the shallow section of the river. At first I thought they had purposely grounded their boat there and were enjoying a swim. Then I noticed that they were waving at the passing powerboats. They were in trouble. They had run aground and the tide was going out. I felt bad for the Dad. Here he was stuck with his wife and two young girls. I was shocked at the number of power boats that just went right by them ignoring them. How could they not see them waving. At first I thought there wasn’t much Rod and I could do. We don’t have an engine to pull them off and we couldn’t transport them to shore. Then it hit me. I saw a small power boat with two young guys heading our way and they were close. Maybe, just maybe, I could paddle close enough to get their attention and direct them to the family. As luck would have it, these two young men knew the mariner’s rule of helping another mariner in distress. Even though their boat was smaller than the one beached, they went over and got the young family’s boat off the beach. Today was turning out to be a nice day. 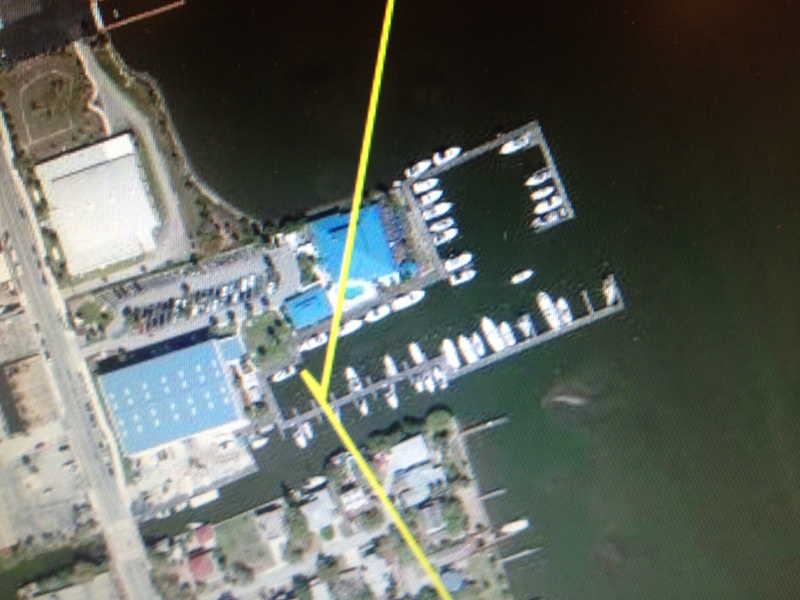 Once we got within sight of the St. Augustine marina, Rod went into restaurant searching mode. I mean how was he going to miss here in St. Augustine? The place has numerous restaurants along the waterfront. Tourism is one of the big draws to the city and what would it be without great food. We pulled into the mariana, docked or boats, and hit the first restaurant right by the water. What made it even better was there was a clean public rest room where I could wash up. Sometimes that was as good as the fresh food. Not quite as good as the cold cokes though. As we were paddling to the docks both of us couldn’t help but notice that the tide was pretty low. There were mud flats all over the place. Hmmm, could it be that we had perfect timing? Could it be that we had came in on an outgoing tide and could possibly pass the inlet and then have an incoming tide? No way! That would be just too good to be true. The meal itself was expensive. It wasn’t the best of the trip but it sure beat a dehydrated meal and the cold cokes were outstanding. As we got into our boats I noticed that the tide was running slack. Hmmm, maybe we did hit it perfectly. The more we paddled the more we realized that the tide was slack which would mean pretty shortly it would switch to an incoming tide. We couldn’t have timed it more perfectly. Hey, even a blind squirrel finds a nut sometimes! The crossing was very non-eventful and we headed into the Tomalto River. The further north we paddled on the Tomalto River the narrower it became until we hit a section just north of Cook Landing. 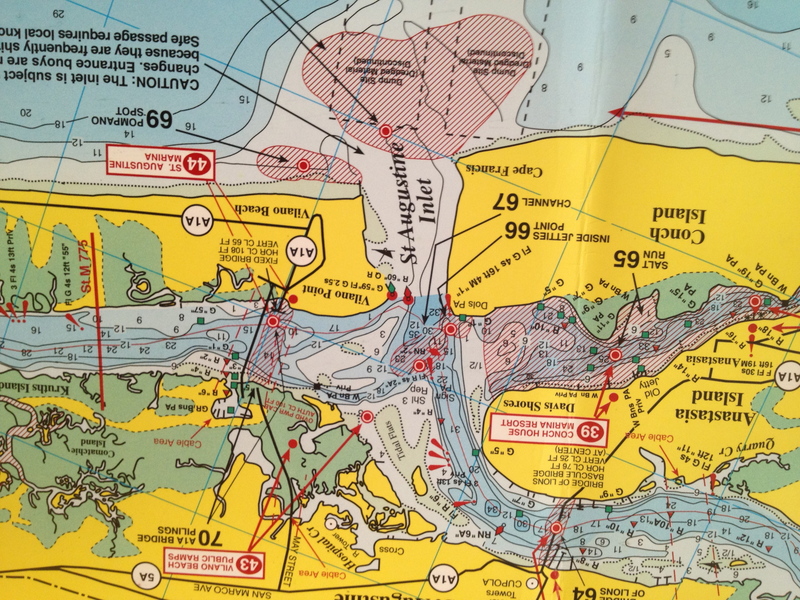 If you look on a chart you will see that the ICW is pretty narrow and very straight through this section. On one side of the ICW is the Cabbage Swamp and on the other side are these beautiful waterfront houses in a subdivision called Palm Valley Landing. I guess the folks that live here work in Jacksonville. There is one road in and out of this area and it is a very long road. From the water it is really a very beautiful section of water to paddle in. Up to this point Rod and I had been very lucky in finding camp sites. We had always seemed to find one without a lot of time spent looking. We had passed several nice spots earlier in the day but it was too early to stop then. We needed to get in as many miles as we could today to ensure being able to get to Fort Clinch in the day light hours tomorrow. So when it came time to look for a camp site for the night it was dark and the ICW banks had changed. Instead of solid ground we were now looking at shorelines of grass and marshes. We started working the shorelines and for those that have paddled at night they can tell you that things don’t look the same at night. What appears to be a solid bank from a distance will end up being a line of grass when you get right up on it. We kept passing one marsh and grass line after another and it was getting later and later into the night. The only positive was that we were still making head way north but it was slow going. I could tell that Rod was tired and ready to call it a night. He headed to an island that was shown on the chart. The only problem was the island was surrounded by 25 yards of this short weed grass in very shallow water (1-2 Inches). This is when Rod stated, “Hey, this should work. We can sleep inside our boats.” I am saying to myself, “Do what???? You have got to be kidding!” I know he was tired, and I was too, but there was no way I was going to get a good night’s sleep inside my boat. Yes, I could get inside of it but it was wet and dirty. Just wasn’t going to happen. I would rather spend another three hours paddling versus trying to sleep there. This is where being easy to get along goes a long way. Rod listened to my argument, agreed to continue paddling on, but closed with, “Ok, but you will have to find the spot because I am tired of looking.” As I looked at the chart there was a lot of green showing on the banks in front of us, meaning nothing but marshes. But there were a few spots of yellow. Well we got lucky as one of the those yellow spots turned out to be a small beach big enough for both of us to set up our tents. Ahhh, sleep at last!!! Beep, Beep, Beep, Beep. There was that trusted morning alarm signally another day. As with other mornings, my first thoughts after hearing the alarm was going through a mental assessment of my body. How are the legs feeling? How is the back feeling? How are the arms feeling? How are the hands feeling? Oh yeah, I don’t seem to have any feelings in some of my fingers. Hmmmm, should be an interesting day. Then I would turn the light on and do my visual inspection. Yep, the hands look better than last night since all the blisters were drained, but still have to doctor them up to get through the day. The nails look pretty bad so pour some Listerine in the ones where the blood has dried up. Want to keep any infection from starting. After all that, breakfast. And guess what? I am still loosing weight. Better stuff myself as much as I can stand. 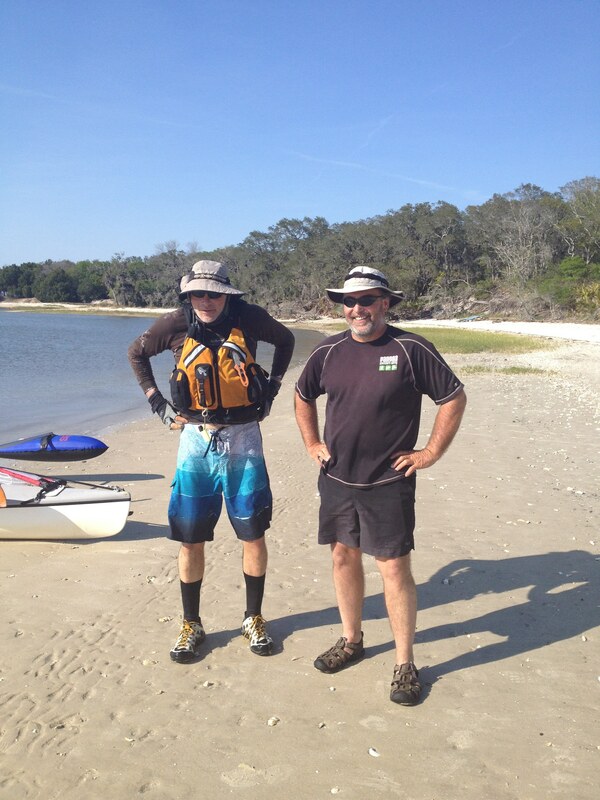 We were pretty close to Daytona Beach and the paddling in this area was all in the ICW. We had lots to see and it was very protected. The one obvious difference of the ICW in the upper part of Florida versus down in the southern part of Florida was the attitude of the boaters. In the northern part, they were courteous and very aware of their wakes and the impact on small boats. They also seemed to understand the “rules of the road.” What a novel concept. It was a nice change from the chaos and dangers we faced in the south Florida area. 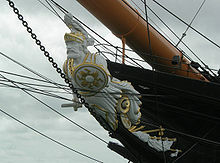 I guess folks in south Florida wanted one of us a figurehead for their vessel. In my previous post, I talked about the music that I would listen to. I use a lot of Apple products and they do a great job designing their equipment. Just one problem… they don’t like salt water. In fact, most of my electronics like salt water. Knowing this, I had tried to take precautions to protect them. I kept my iPod in a dry bag designed for iPods. I kept my iPhone in a pelican case designed for iPhones. Both my primary and my backup GPS units were Garmin 78 GPS Map SC units that are designed to be waterproof and to float. As I shared in one of my earlier posts, I am glad they do float or I would have lost it in Naples. All those precautions were prudent, but I didn’t take into account the greenhouse effect these protective cases can be subject to. For whatever reason, it was about this time in the UFC that most of my electronic equipment started to show the effects of operating in a salt water environment. Only my SPOT and my VHF radio seemed to not be affected. My iPod was the first to go. It started to lockup, not take commands from the touch screen and then just died. Great, no music for me. I am left with two options…. counting waves or bugging Rod. Then I went to change the batteries to my GPS and was taken back by what I saw. 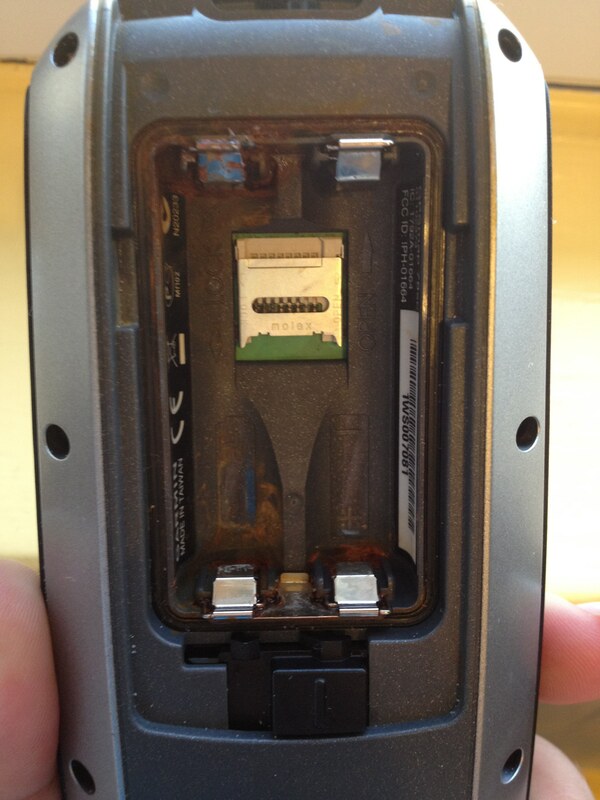 The inside battery compartment was rusting. This was the first time I saw this but there was no question, I had a big corrosion problem. I wondered what the inside of the unit looked like. I needed this unit to make it at least another two weeks. 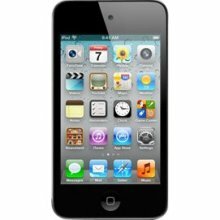 Losing the iPod was bad, the GPS was the not good, but the worst was when my iPhone died. I have shared before that I am not much of a talker on the phone during these events. In fact, Lisa had a lot of irritating things to pick from from that frustrated her, but probably the biggest thing that I did during the UFC that irked her was my lack of communication. So you would think that having my iPhone die wouldn’t be the worst thing as compared to maybe my GPS, but it was. Even though I didn’t talk long on those calls to Lisa, those calls were very important to me emotionally. Without the phone and those daily short calls, I found myself missing her greatly. Those hours that would have been filled with listening to music were now filled with the emotional feeling of missing her and my kids. So what caused these problems? Did the protective cases have leaks? No. The fact that they were so waterproof caused the problems. What I think happened is that each time I opened the cases it allowed air filled with moist salt air to get inside the case. Then, with the case closed all day and out in the heat, the inside of the case became like the inside of a greenhouse. Hot, humid and moist air had no place to go but into the very devices the cases were designed to protect. 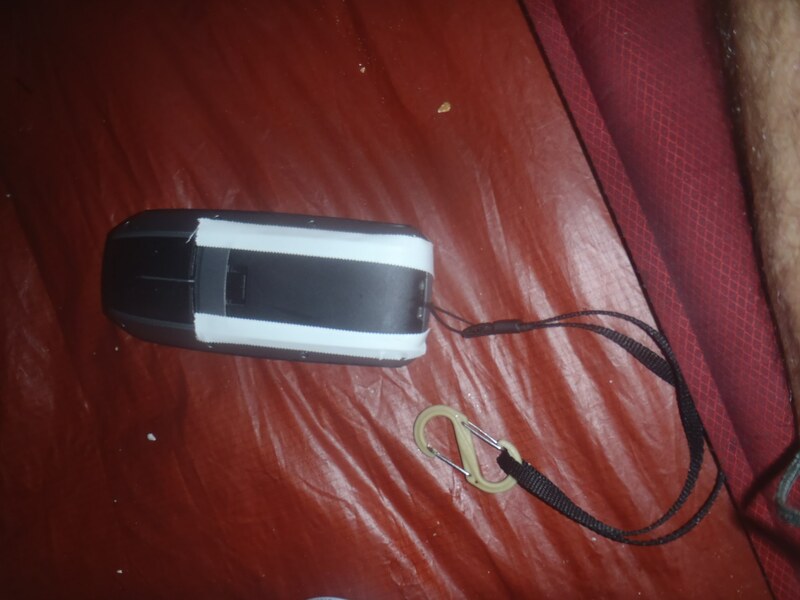 On the GPS units, I would try to take great efforts to use a paper towel when I was changing the batteries but again, that process allowed the air inside the battery compartment. I also found that I had to be very careful to get the back panel attached perfectly. Ultimately, I ended up using tape to make a double seal on this cover. As I looked at my dead iPod and iPhone, deep from inside my memory banks a memory of the day before the UFC while on the beach came back to me. 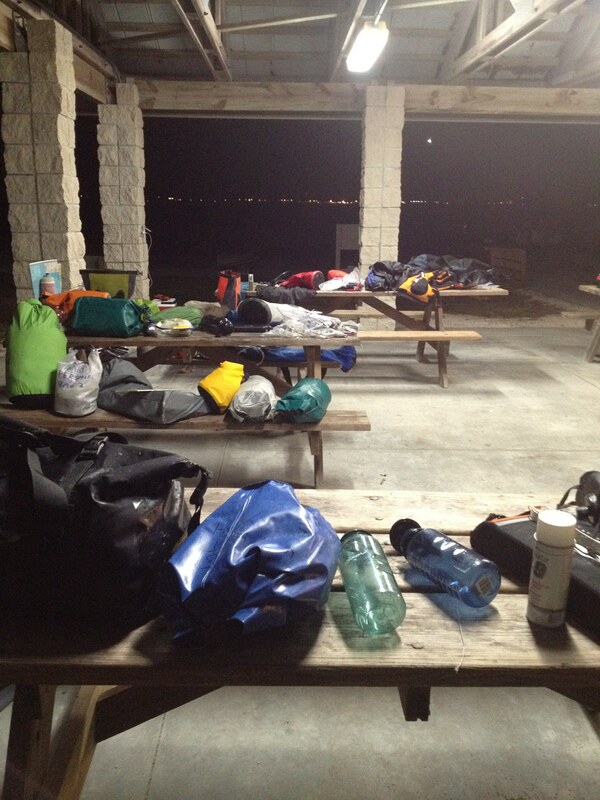 I was getting my stuff packed and getting organized when a very seasoned WaterTriber named “Whitecaps” came by. He saw the protective case I had for my iPhone and said, “I don’t like those things. They cook the electronics in them.” I thought that by keeping things dry and putting a paper towel in the cases they would be protected. I was wrong and this was the third tip Whitecaps had dropped on me that I had ignored. Ultimately, every one of those tips that he dropped on me that I ignored, came back to haunt me. Lucky for me all the other tips I listened to. Oh, and for those that are wondering, I tried the rice-in-the-bag-thing to dry out the phone. All that happened was that I ended up partially cooking a bunch of rice and a dead iPhone. That is how much moisture was is in the air and how hot it got at times. Daytona Beach is a pretty populated area which meant that we might find a marina to stop at. Sure enough, we found a pretty nice one. It had a bathroom and a pretty nice store but no breakfast sandwiches. It also had a pool that looked so inviting. (I don’t think they would have been very accepting of two dirty paddlers jumping in their pool.) Not having any breakfast sandwiches was not what Rod wanted to hear but they had food and cold Cokes. Coming into the marina it was kind of odd to have someone help with docking. I mean we are only 18 ft long and we can pretty easily push ourselves around but folks wanted to help. As with other locations, we were not at the location long before Rod is making friends. Before I know it, we have a couple on a boat wanting to get web pages, tribe names and information on us and our event. I really didn’t realize how many people were following Rod and I on the internet until I got home. This picture was sent to my wife from someone we didn’t know who was following us. Glad they caught us paddling versus being in a restaurant stuffing our faces. The camp site that we ended up at the end of this day was one of the best of the UFC. It was on a nice beach island. The wind was blowing enough to keep the bugs off but not so much to get the sand blowing. The sky was clear, the stars were so bright, it was beautiful. Then I got the reminder that I wouldn’t be talking to my wife. I didn’t want her to be worrying and thankfully the SPOT was working fine. She would at least see the “OK” message on the computer and know that I am alive. So, What Do We Talk About Now?! I guess the rat that Rod had seen when we landed on the island decided to move to a different part of the island, or was a rather stealthy rat, or I was so tired I didn’t hear it. I slept great at this campsite and felt pretty refreshed when I woke up. We really had been pretty lucky in finding campsites and I hoped our luck would continue. We had many more nights in front of us. During the first part of the UFC when we were having to paddle in some very difficult conditions, I never found myself getting bored. The difficulty, the pain and constant efforts to figure the next move kept my brain pretty engaged. Paddling in good conditions is nice but unless there is some radical scenery change, it can get pretty boring. Especially in open smooth water where you cannot see the bottom. Counting paddle strokes gets old pretty fast for my brain. Rod and I were lucky in that we had each other to talk to which would break the monotony. But neither of us can hold a conversation for fifteen hours straight and there are only so many life stories you can tell each other. One of the nice things about having individual boats is that if you wanted to get away and be by yourself, you can. Folks paddling tandems don’t have this luxury. Next to talking to each other, the next best thing to break the boredom was music. I started the trip off with an Apple iPod Touch and Rod had a waterproof AM/FM radio from Radio Shack. For both my phone and my iPod, I had tried to implement measures to protect them from the elements. For the iPod, I had a waterproof bag that had a wired connection that allowed me to connect ear buds without opening the bag. I also had an external battery source that used AA batteries. I thought this was a pretty good system but found out later it wasn’t full-proof. That is a story for another blog. Someone asked me what kind of music I listened to. I think music is a very individual thing and what one person likes, another doesn’t. The music I listen to is not considered “main stream,” so an iPod worked great for me. For Rod, the radio seemed to worked great. These are a few of the songs I listed to. They worked for me, but like I said, everyone is different on their music taste. As we paddled north, the wind started to picked up and was blowing from the east. For most of the morning this wasn’t a problem because we were pretty much protected by the eastern shore of the Indian River, and the wind wasn’t that strong. This changed when we passed Titusville. Here, the Indian River dead ends and we needed to cross over to Mosquito Lagoon. This meant we needed to paddle east north east for about 5 miles to get to the Haulover Canal. I guess we had gotten kind of spoiled by not having to paddle for hours on end into the wind because these five miles seemed to be extremely difficult. One of those put your head down, keep paddling and don’t get bent out of shape because of the slow speed. Finally, we entered the canal and thankfully the current wasn’t unbearable. Things did turn around once we exited the canal. We were headed north. This meant I could use my sails. Wow, the last time I had my sails out was crossing Biscayne Bay. The next ten miles were great. Rod was able to draft behind me and whatever time we lost fighting the wind to get to the Haulover canal we were making up. It was a nice sail and to cap it off, we found a great restaurant in a community called Oak Hill. It was obviously a favorite among the locals because it was pretty crowded. As with the other restaurants we visited, people were very friendly and very curious about our rigs and what we were doing. It was always hard to get back in the boat after a great dinner and this time was no different. It was still day light and we had more miles to cover so back into the boats we went. The next big town we would pass through was New Smyrna Beach. 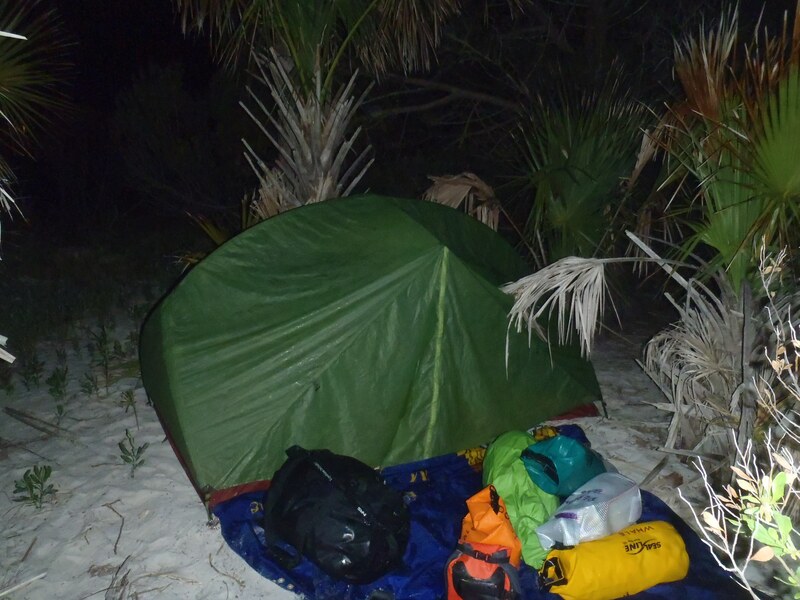 In looking at the charts, there were no obvious islands to camp on except an island called Chicken Island north of the bridge to New Smyrna Beach so that was our goal. 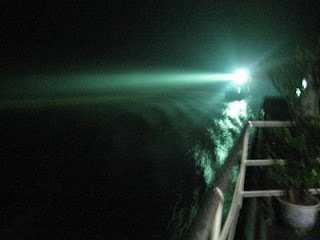 It was dark and late when we got up there and as we started to scope the island to find a beach area, a boat pulled out of a canal and scanned us with a spot light. When that happens your first thought is it is the police. We really didn’t see a good landing spot so we just kept paddling north. The only problem was that this boat kept following us and scanning us with their spot light even though we were hugging the shoreline. They wouldn’t speed up or pass us and they seemed to adjust their speed to stay about 250 yards behind us. Great, we have a stalker! Not knowing the rules in this area, we kept paddling hoping that if it was the local police, they would turn around and leave. Nope, didn’t happen. Finally, after 45 minutes of this, along with a prospective campsite approaching, we decided to just land our boats and deal with whoever was on this boat. I was bewildered when the boat finally did pass us. It wasn’t the police, it was just some boater out for a late night cruise. Go figure. In the end, he had pushed us to a pretty good campsite. The wind was blowing so there were no bugs. The air had some coolness to it so overall a good night’s sleep was in order. Ahhhhhhh, take over sleep fairy. Even though I could have used another two hours of sleep I slept pretty good at Sebastian. I wished Lisa and I had more time together but that would have to wait until I finished this event. It is kind of amazing how easy it is to fall sleep when you don’t have the most comfortable conditions but you are really tired. Since Rod and I didn’t have that much gear out it was pretty easy to get the boats packed and on the water. Two stages down, three more left, and we will have competed the UFC. There was some sad news that we got at this checkpoint and that was Salty Frog had dropped out. 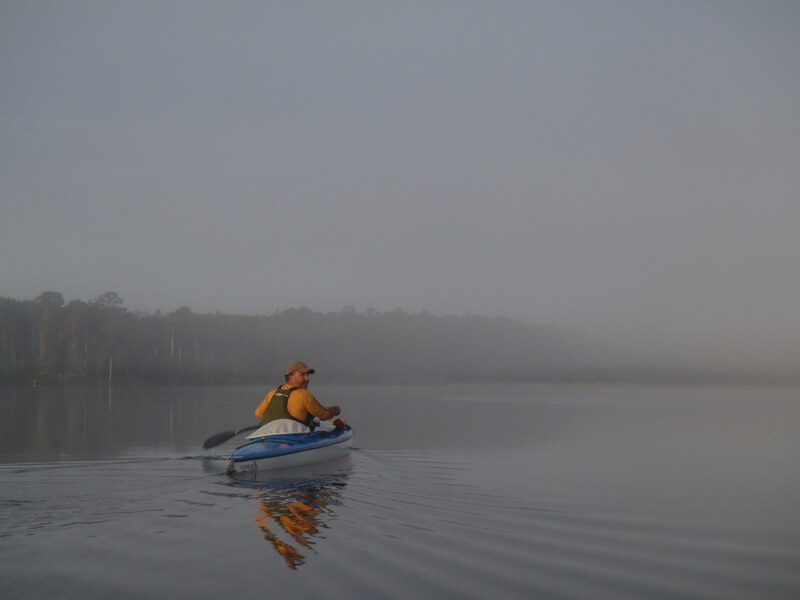 Salty Frog is an excellent endurance paddler with several long endurance races under his belt. While WaterTribe challenges are classified as races, we all want each other to finish. If you ever meet Salty Frog you will notice that there is not a bit of body fat on the guy. 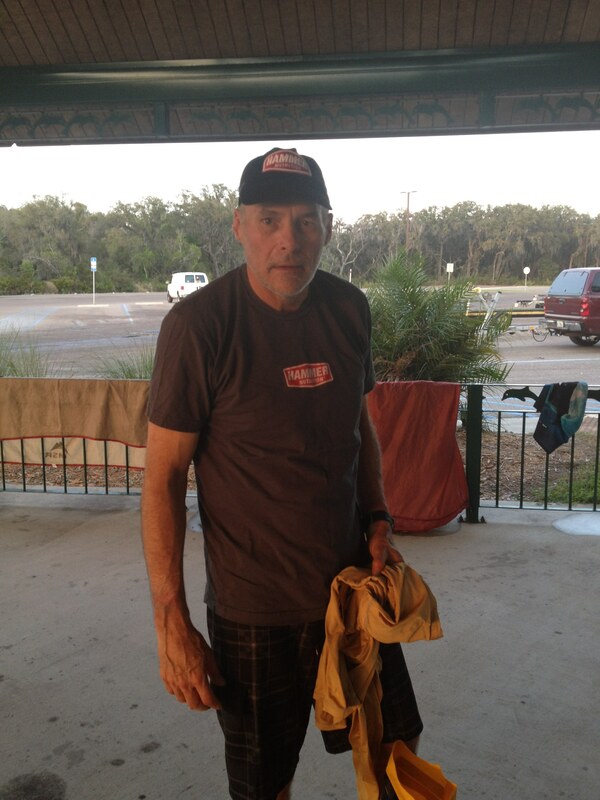 He is a lean mean and very fast paddling machine. Since the start of the UFC he had been losing a lot of weight — similar to what I had been experiencing. The issue for him was that he didn’t start off with that much to lose and it caught up to him. As the body starts to feed off itself, you can only go so long before serious problems develop. The weather for the day called for very little wind which meant it was going to be a hot one. The injury on my right leg was healing up nicely which meant that problem was going away. Unfortunately, I had two others starting to develop. These two problems stayed with me the rest of the UFC. 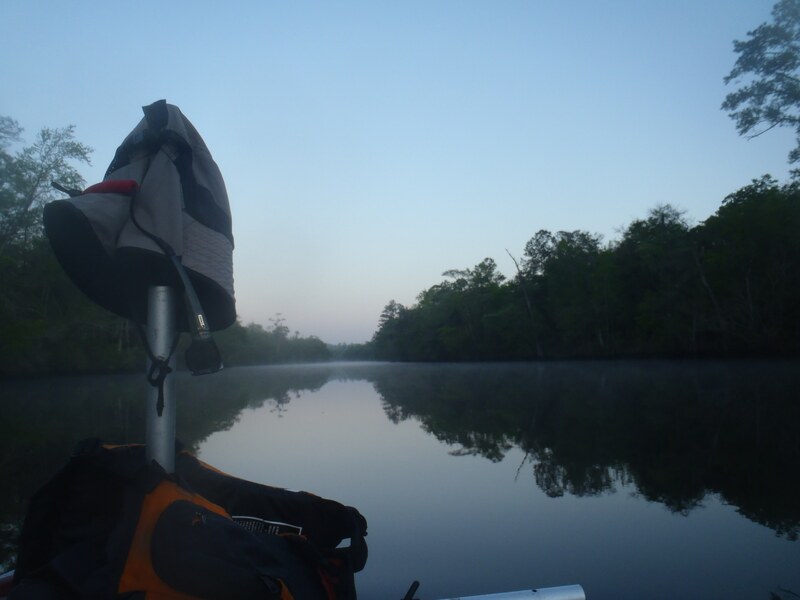 The first problem I was experiencing would show up about an hour and half after I started the morning paddling. Up to this point my breakfast routinely consisted of a bottle of Ensure, a piece of fruit (apple or an orange), some multi-purpose vitamins, a “Breakfast on the Go” by Emerald (essentially a nut and granola mix), and a Hammer energy bar. I was starting to experience something that I did not experience the first two weeks of the UFC. That being I would become seriously sleepy and I would stay in this state for about an hour and a half. It was really pretty bad. The sleep fairy had sprinkled her magical dust on me big time. Then all of sudden it seemed like a switch was thrown and I would be wide awake and paddling strong. During the time where I was sleepy I had big problems keeping my eyes open and my head up. This got to be a real challenge on days where there was no wind and the morning air was warm and humid. I mentioned in my earlier post that Rod is a morning person and wakes up all charged up and ready to go. We were on opposite sides of the energy spectrum. This is where I discovered what folks mean by sleep paddling. Yes, I was paddling, but with my head down and my eyes closed. I was moving the boat but it was at a speed that was nowhere near what I would normally be maintaining when I was wide awake. Rod would end up quite a distance ahead of me when I could finally get through the slump. For the rest fo the UFC I would have this problem and it seemed to be unaffected by how much sleep I got or how big of a dinner I had the night before. The two days where it didn’t happen was when I was facing some challenging navigation situations. I guess the stress of that kept the sleep fairy at bay. There is no doubt in my mind that your body chemistry changes when you are doing a multi-day endurance event. I started experimenting with different food protocols for breakfast but the same thing would happen. As I look back on it, I think my body was having problems locating fat reserves to turn into energy. For my body, after about an hour is when my body starts the process of getting fuel from fat versus the glycogen in my muscles. I think the dinner and late night snack (mixed fruit cups and fig newtons) was building glycogen in my muscles but due to the amount of fat I had lost, my body was having problems starting the fat to energy conversion. I do feel the Hammer energy products helped me through the slumps but it was a big time mental war to not stop and fall asleep. Thankfully Rod stayed with me as I went through those periods. He could have easily paddled away because he didn’t seem to have this problem. It seemed like his energy levels would run low in the late evening and he would fight the sleep fairy then. It was during one of these morning struggles that Rod gave me a product called “Five Hour Energy.” He even had some Extra Strength Five Hour Energy that he would save for a last-ditch effort to stay awake. They did help, but didn’t make the sleep fair go away. I ended up just sucking it up and developing the mental stubbornness to deal with it. The second problem I started to have is a pain in my right hand. I had several finger nails that had been banged up and had blood under them. I was pretty much expecting this. It has happened to me before in some of the other races I have been in. Usually it is caused by a wave that slams my paddle into the boat and my fingers are the only thing between the boat and the paddle. It does hurts when this happens and it really hurts when it happens to one of the nails that already has some has blood buildup under the nail. As I stated in a previous post, I had blisters on my hands, but I had also expected this and was following my plan on doctoring them every night. So those two issues I knew I would experience and I knew how I would manage them. The pain in my right hand was different. It was some nerves screaming they had enough of this craziness. I found the pain to be pretty intense for the first 45 minutes and then slowly my hand would go numb. When this happened, the pain went away and would stay away for the rest of the day. I would have this numbness, but I would still have enough feeling in my hand to control the paddle. I guess at night the nerves would start to heal because the numbness would be gone in the morning, no pain and my fingers would be stiff. With some rubbing and working them I would get them moving but there still wasn’t a lot of pain. That would immediately show up when I took my first stroke. 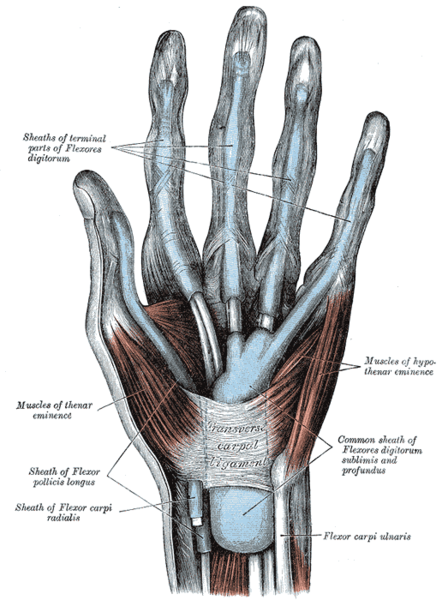 This condition got worse, would cover a larger area of my hand, and a duplicate condition started in my left hand with each passing day of paddling the UFC. The not-so-pleasant part about nerves is that it is pretty painful as they start to heal and they heal slowly. So finishing the UFC started that process. It took about two months to get my hands where I wouldn’t have any pain when I used them. Mornings were the worse and for several weeks my first order of the day after waking up was to put my hands in warm water to get them to loosen up. Today, 4 months after completing the UFC, I feel I have recovered pretty well. 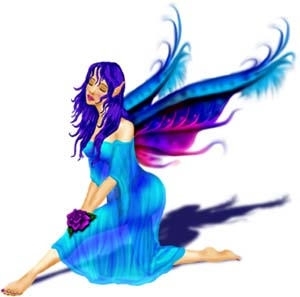 I no longer have problems fighting the sleep fairy during the day. That was interesting considering that my job requires me to attend a lot of meetings and some of them can get pretty boring. Some of my co workers must have thought I had a bladder infection due to the number of times I would leave a meeting. What they didn’t know is that I wasn’t going to the bathroom, I was trying to wake myself up. As far as my hands my nails are almost back to normal. The nerves in my hands, well I started paddling about two months after the UFC. My hands were not completely healed but I really needed to get back on the water. Everyone has their escapes from the pressures of life. For me, being on or in the water doing some type of physical activity is my escape. Not being able to enjoy those two activities results in a very grumpy whale. I still have times, like this morning , that I still have to soak my right hand in warm water to get it working without any pain in two of my fingers. I have tried to mix in some different types of paddling (kayaking, SUP, and dragon boating) to avoid the same exact repetitive motion that I had in the UFC. The first day of stage three Rod and I got in some pretty good mileage and ended up stopping at an island just north of the bridge for A1A going to Port Canaveral. The island had a small beach and a flat area big enough for a couple of tents among a bunch of small trees. It was dark and Rod got out of his boat first. 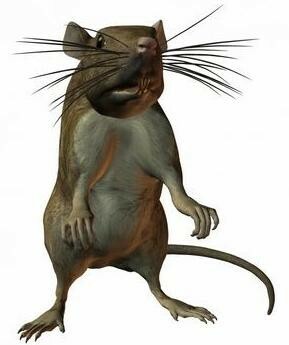 Then, all of a sudden, I hear him yell, “Rat!!!!! A Big One Too!! !” As I look up, I see Rod getting a stick and moving back to the boats. That rat is coming back! He is not running away! I never really saw the rat but I did hear it so it was big. It really had an impression on Rod because Rod kept shining his light into the bushes and watching the bush line for the rat. Being the nice guy that I am, I let Rod have the camp site closest to the place where the encounter with his buddy the rat had occurred. I didn’t want to interfere with this new friendship. I also decided that my python eliminator could also be used as a rat eliminator and I kept it close by as I made my dinner. In fact, I used it to open my dinner just in case the rat was watching. Not only was the rat big I think it must have been pretty smart because it never came out while I was eating my dinner. Ahhhhh No worries here. Sebastian Here We Come !!! Due to the fact that we had put in such a long day we decided to set the alarm for an hour later than normal. Ohhhh man that extra hour of sleep was so nice. Kind of amazing how a simple thing such as an extra hour of sleep had become so special and valued. I was pretty excited about the upcoming day because we were only about 35 miles from Sebastian Inlet which was check point 2 of the UFC. I kept thinking about what would be waiting for us at this check point. Fresh food, a shower with hot water, a good 8 hours of sleep, and seeing my wife. I think this was the first time that I had my boat packed first and was waiting on Rod. For the most part the paddle up to Sebastian was pretty non eventful. The wind was blowing pretty good but it was blowing from the east. 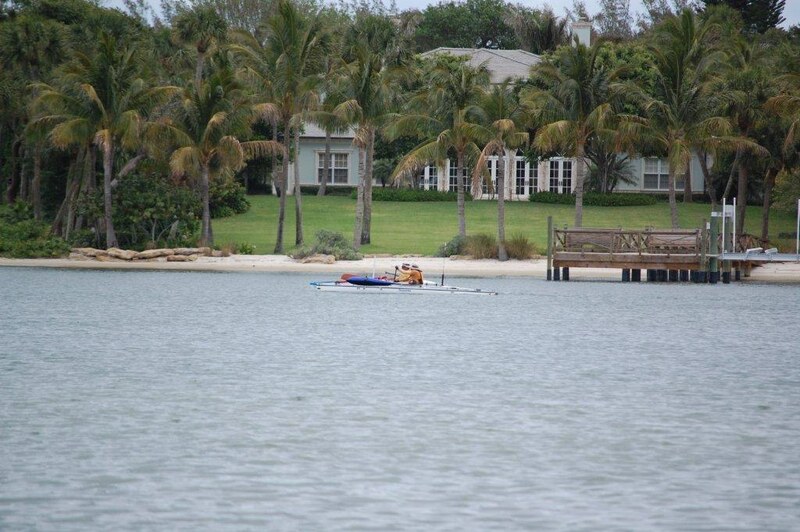 Since we were in the intracoastal waterway we were pretty protected. That was until the last four miles where we entered a large open bay that was very shallow and exposed us to the wind. It is a little un-nerving when you can see the bottom so close and the more you paddle the shallower it gets. You start to worry about running aground within sight of your final destination. One of those “so close yet so far ” events. The charts said we should have more than enough depth to get to the Sebastian Inlet boat ramp so we just kept pressing on. Thankfully the charts were right and we had good water depth all the way to the boat ramp and the checkpoint for Sebastian Inlet. 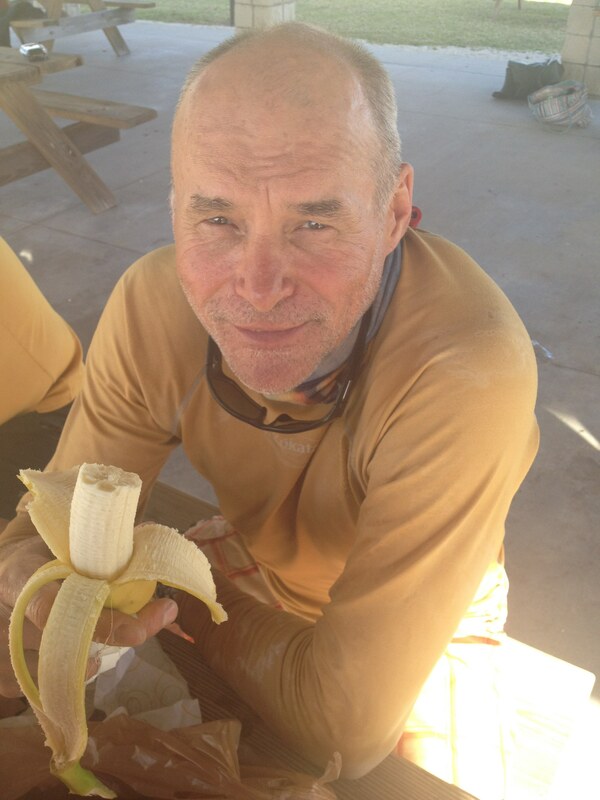 We arrived at the checkpoint around 5:30 in the evening which should have meant lots of time to eat, get resupplied, and get some needed sleep. Chief was there along with Mosquito Magnet (another UFC participate), Ed a friend of Rod’s, and more importantly Lisa. It was good to see her and did she had a bounty of food for us. Sandwiches, grapes, bananas, cold watermelon ( my favorite), fruit cups, apples, oranges, and oh chocolate covered Edmonds donuts. ( another favorite). It all tasted so good and it seemed like I could not get enough of it. I just didn’t want to stop eating. Unfortunately there was still some work to do. I needed to repair my rudder and pack enough supplies to get to the next checkpoint at Ft Clinch. I had bent my rudder when we were leaving our camp site just before Biscayne Bay. Rod and I had bent it back but it still had a 20 degrees bend in it. We were both worried that the method we were using to bend the rudder could break it. Now I was pondering how I was going to bend it further without breaking it. Then an idea came to mind. Why not run over the rudder with the truck Lisa had driven over? This would be like a press and would have a much lower chance of breaking the rudder. So off to the boat I went to remove the rudder. As I was walking down to the boat I was thinking this should not be a big deal. Get it done, jump on the repacking of supplies, grab a shower and hit the sack. Rod being Mr. Efficient was already snoring away. As I was removing the rudder bolt I saw it. Something very unpleasant and something that was going to change my plans for the night. My port rudder cable had several broken strands of wire. I was lucky it hadn’t completely broken. As much as I kept saying this can’t be happening those broken strands stayed broken. I had inspected my rudder cables every night, had shot silicone lubricant on them at each checkpoint, and they were in great condition. Great !!!!! My nice leisurely schedule for the night just went down the tubes. So off came the rudder and after a couple of times of being run over it was straight as new. I had a couple of spare rudder cables but had never changed one before. I won’t go into all the details of what was required to replace this one cable. What I will say is that it was a two person job, aluminum and stainless steel like each other so much that they grew together making disassembly a bear, and disassembly of the internal rudder peddle assemble was required. All that on top of the fact that it was dark and the mosquitoes and flying teeth ( No-See-Ums) were out in force making this task very unpleasant. 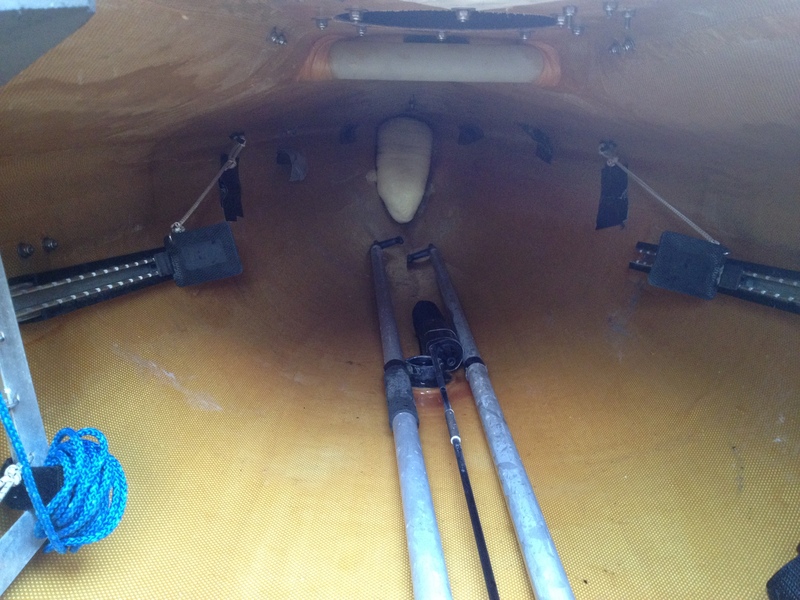 Lesson Learned – Always carry spare rudder cables, give rudder cables the best maintenance you can, and modify your equipment to be able to change it out as easily as possible. For sure modify it so that it can be done as a one person job. After several hours my boat was ready for the next day’s trip and now it was time to start repacking. As I explained in my previous post about checkpoint one ( Key Largo) I had all my supplies organized into bins and marked so that Lisa knew which ones to bring. These bins were marked by stages/checkpoints versus what supplies were in them. Big mistake ! The errors in usage rates of the supplies from CP1 were now compounded here at CP2. I had throughly organized my supplies, with great thought on efficiency, into a mild level of disorganization and inefficiency. I was able to find stuff but it wasn’t easy. Thankfully we had a covered pavilion with lights and several picnic tables. I was able to spread stuff out and ultimately get some level of organization. When things get disorganized I don’t like it. I start to get anxious and grumpy. Maybe it was my time at a service academy, my time in the military, or the fact that being organized gives me the freeing I am in control. Whatever it is I don’t like disorganization. By the time all the repairs were done, all the repacking was done, and I had taken a shower it was close to 11:30 PM. My desire for a good long night of sleep was now a figment of my imagination. I really needed to try to get some sleep. The alarm at 4:30 AM wasn’t that many hours away and Rod would be fresh since he had been sleeping since 7:30. I hated to say good-bye to Lisa but there were no hotels close by and why sleep in the truck or on the ground with me if she didn’t have to. So we said our good-byes and I found a piece of ground to crash on. Thankfully the mosquitos and flying teeth had found some other place to be. I had mentioned in my earlier post the importance of having a good support system to be able to do this event. This checkpoint is an example of how blessed I am to have the person that I do for my wife and the type of support she provided me. The food and supplies she brought to Rod and I were wonderful but she did so much more. She was the one helping me fix my rudder and replacing my rudder cable. Among the many things that I love about my wife is that she is very comfortable with tools, knows which tool is which, and knows how to use them. Oh and don’t forget that she was dealing with the un-pleasantries of doing something in the dark with biting bugs. She didn’t complain once about the bugs even though I knew they were biting her just as much as me. The bug spray wasn’t working. This is from a women who was a model and a ball room dance instructor before she was a mom and wife. If I stopped there I think you would have to agree that the support she was providing me was over the top. What I didn’t know at the time and I found out later was that instead of stopping at a hotel that night she drove all the way back to our home on the west coast of Florida. 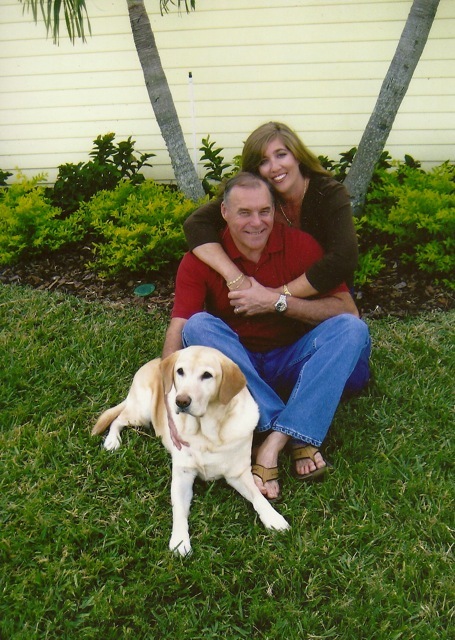 My wife is the primary care giver for her grandparents and they were having some medical problems at the time. At their age any medical problem is a serious one. So on the day my wife came over to Sebastian her day started out with the normal things associated with running a house with two teenage boys, doctoring a sick 90 lb labrador retriever that had eaten something and was trying to get rid of it out of both ends, ensuring that her two grandparents would be ok until she got back, driving 3 hours to meet me, packing all my resupply bins, stopping along the way to buy food, helping me fix my boa t with biting bugs, all the while smiling, telling me she was proud of me, that I was going to finish this thing and then driving 3 hours back home in the early morning hours. She needed to be back to deal with all the issues at home and ensure her grandparent’s condition had not gotten worse. If I knew half of what she was dealing with I would have found another way to get my stuff. She was dealing with way more than one person should have to. Really blessed to have her as my wife and she played an important part in my ability to complete the UFC.